GOSHEN – Horses were trotting and pacing again at Goshen Historic Track last Sunday, June 11th. The races began on schedule on a beautiful sunny day, and a track record was set as “Keystone Velocity” lived up to his colorful name. 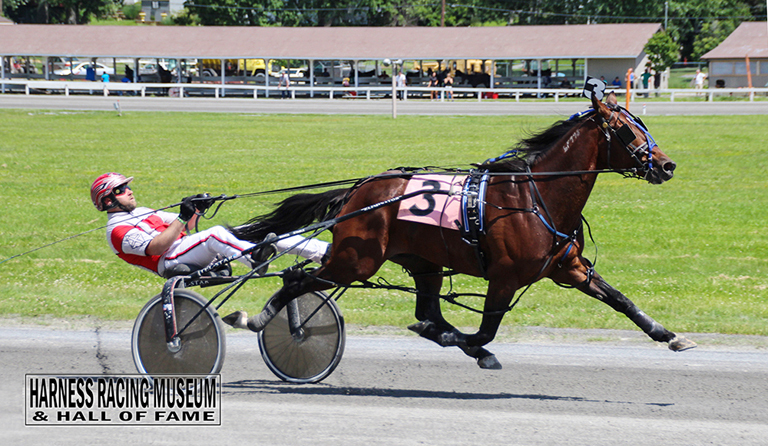 The aged pacing stallion surpassed the 1982 record for his class by 5 seconds or 25 lengths. “Gonnakissmeornot” and “Precious Blue Chip” also had a great day, along with five other magnificent Standardbreds that won their races at the world’s oldest harness racing track and earned their owners and drivers a spot in Winner’s Circle. Many of the horses that won or placed train and board at the Track year round. The Matinee Race was the second in the 107th season of racing at Goshen’s venerable national historic landmark. This year is turning out as a memorable one for the Track. Besides the addition of an equine hydrotherapy spa that is available to all horses in the region, the original grandstand, a bequest of Mrs. Mary Harriman in 1911, was entirely refurbished. The iconic roof and cupola over the BOCES barn, where BOCES students once learned about equestrian care, is now being restored. There has also been a lot of landscaping and beautification of the 22-acre site. As the season progresses, even more improvements to the venue will be seen. One doesn’t have to be a horse racing fanatic to enjoy the sight of magnificent Standardbreds trotting and pacing in a 19th Century setting.